Hello friends! Over the last 3 years, I have tried blogging multiple times and I haven't been so great at remembering or wanting to post. But like I tell my students if at first you don't succeed, try, try again. 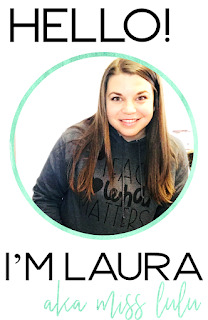 My name is Laura. I have been married to my sweet husband for 2 years and we just had our first baby, Evan, on May 7th. At my 20 week ultrasound, we learned that Evan has Spina Bifida and when I was 26 weeks pregnant, I had fetal surgery to repair his open spine. The last few months have been quite an adventure but I would do it all again in a second. This will be my 4th year teaching life skills (severe disabilities). I teach middle school (6-7th grade) in Utah. I have a dual degree in elementary education and special education with a severe emphasis. I am starting graduate school this fall to get my master's degree in Special Education with a concentration in Transition from School to Adulthood. Because of my background in regular education, I have always been a very academics driven teacher and I am excited to learn more about transition and how to help my students prepare for life in the real world. I have been selling on TpT for almost 3 years and I'm hooked, both as a buyer and seller. I love being able to share resources that have helped me and have been successful in my classroom. Thanks to the TpT Seller Challenge, I have been motivated to try this whole blogging thing again. I hope you find some encouragement, tips, and laughs here to help you in your classroom! Thanks for visiting! Welcome to the blogging world, and congratulations on your baby! I love your blog design. Good luck with graduate school.